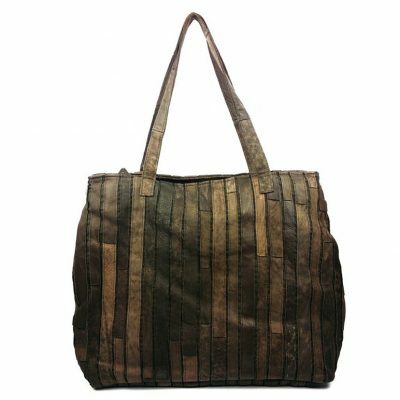 Genuine leather handbag, handmade leather handbag and vintage leather handbag for sale, all these leather handbags are handcrafted by expert artisans. 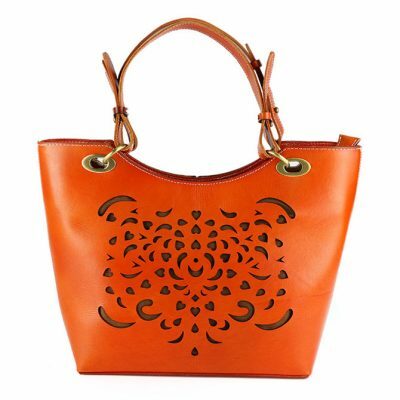 We only offer high-quality and high-end handmade leather handbags to our consumers. A stylish leather handbag is like a portable life for women. So we always need a bag that will protect everything we care about. 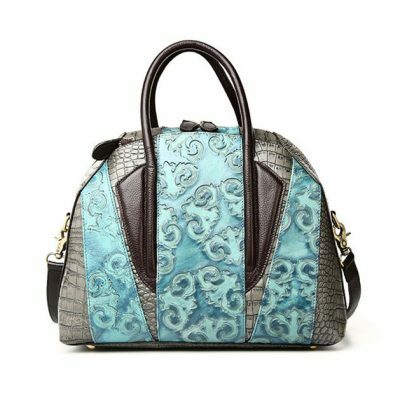 VANGOSEDUN leather handbag will fulfill all your expectation. Handbags have become one of the most well-known women’s accessories available on the market. 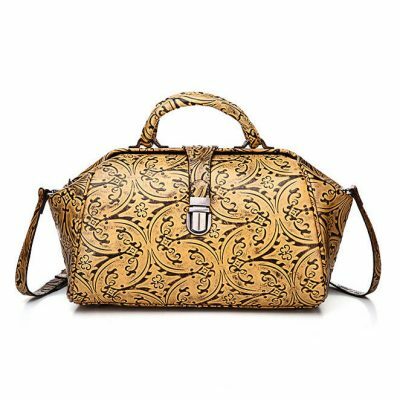 These are not just considered as functional items that help them carry their necessary belongings but also one of their significant preferences in succeeding the best fashion style they most desire. 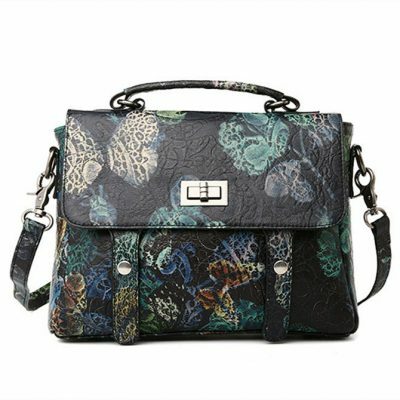 We offer all kinds of leather bags such as leather crossbody bags, leather shoulder bags, leather totes, leather hobo bags, and traditional handbags in styles, colors that range from the classic to contemporary. 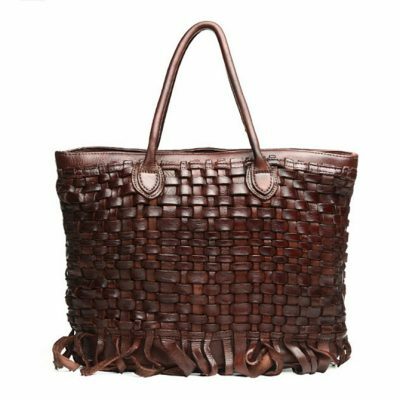 Whether you choose a timeless black or brown leather handbag, or something more colorful, VANGOSEDUN leather handbag should be a design that reflects your personal style. For making our luxury leather handbags, we do not procure leather at cheap rates. Each piece of the world famous Italian leather that we use is hand-picked by our experts from tanneries around Naples, Marche, and Benevento. Various types of leather may be used including cowhide, calfskin, crocodile, ostrich, and suede. Each type of leather has a unique look and feel. Some may have a pebbled or crinkled appearance, while others are glazed, distressed or patent. Hides can be dyed virtually any color, so purses are available in natural shades like black, brown, beige, cream and camel, as well as brighter tones of green, red, yellow, blue and purple. For daily use, leather handbags stand up well to wear and tear. Generally, leather bags actually look better with age and never seem to go out of style. Hardware like zippers, buckles, and snaps may be gold, silver, brass or nickel. Fabrics used for interior linings include cotton, nylon, polyester, silk, and satin. They may be a subtle, neutral shade that matches the exterior, or a contrasting color, print or pattern. 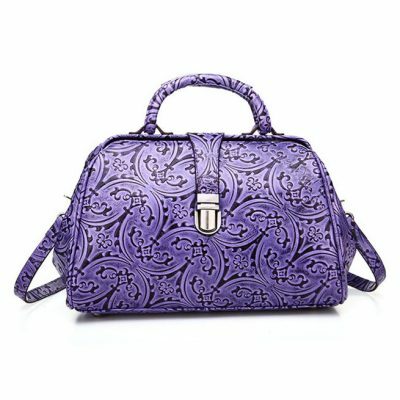 Most of the leather handbags on the market are produced by machines or mechanical devices. This way of production cannot deliver diligent attention to the details, but is certainly the most effective way to produce the items that do the job. Some of the high-end brands create their products hand-made and so do we. It demands the work of highly skilled craftsmen and takes a lot more time. Yet, the huge focus on attention to the details, design, materials and stitching results in the best possible product. Two handmade leather handbags are never 100% identical. Thus, every owner of a handmade leather handbag has the unique product. For many women, no accessory is more important than their leather handbag. Leather handbags are not only essential to carrying everyday necessities but also work to complement the mood and outfit she may regularly find herself in. There are many things to consider when purchasing a leather handbag. Because a leather handbag can represent a significant investment that will last for many years to come, it is important to choose carefully. Leather Handbag Style: Women’s leather handbags come in many different styles, including totes, cross body bags, hobo bags, satchels, and clutches. Choose a style of women’s leather handbag that fits your personality, and complements your choice of wardrobe. When choosing that perfect leather handbag, one item to take into consideration is body type. 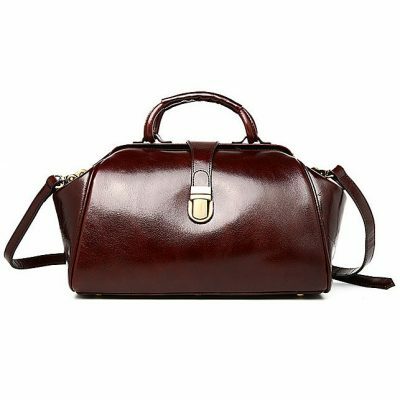 Typically, the opposite-shaped handbag to a particular body type is the best choice, being the most flattering to the body’s form. When choosing a leather handbag to purchase, the shopper should carry the leather handbag in the dressing room as they normally would, checking it out from all angles in the mirror to make sure it is the right choice. 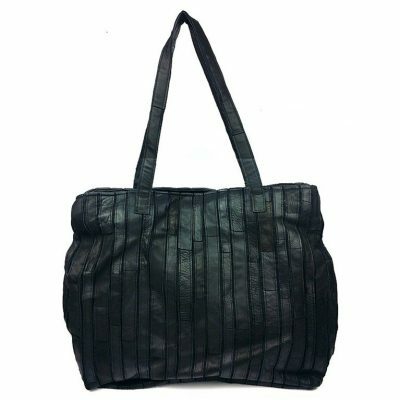 Leather Handbag Material: A buyer should consider the leather quality of a handbag before investing. Finding a genuine leather handbag can be a tough job to do. Handbags usually used Neoprene rubber, PU leather, Patent leather, and many more. But high-end leather handbags are often made from full-grain leather. Full-grain leather refers to hides that have not been sanded, buffed, or snuffed to remove imperfections on the surface of the hide. The grain remains to allow the fiber strength and durability. The grain also has breathability, resulting in less moisture from prolonged contact. Leather Handbag Craftsmanship: Check stitching and seams on the leather handbag’s interior and exterior surfaces. Stitches should be small and even, and seams straight, without loose threads. 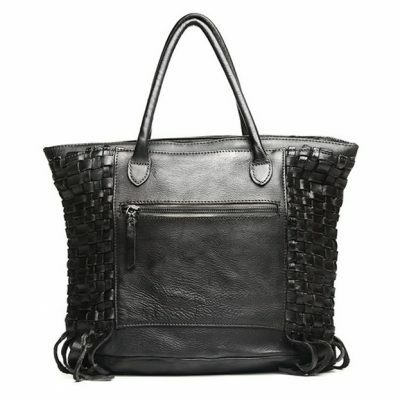 Select a soft-sided leather handbag only if it has a heavy-duty metal zipper. If choosing a hard-sided leather handbag, examine the hinges. Since hinges are the weak point on a hard-sided handbag, look for sturdy hinges, free of rust and visible wear. Durable and beautiful at the same time, the leather handbags can actually last for decades given the best care. 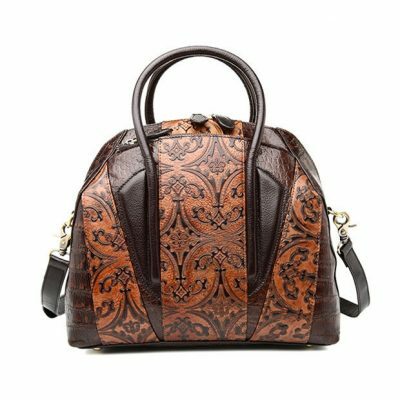 From conditioning and cleaning the leather up to storing in the ideal conditions, there are actually many ways on how to care for leather handbags, preserve their beauty and prolong the lifespan of these valuable investments. Leather handbags are prone to absorbing oils and grease. Wipe the bag’s surface with a damp, white and clean cloth and be careful not to make use of lots of water for this will just make it longer and more difficult for the leather to dry. Soft soap is often used and applied through circular motion and then wiped off using a clean and slightly-damp cloth to not clog the pores of fabric. Apply soap once or twice a year to keep your leather handbags clean. As much as possible, don’t use conditioners on the patent leather handbag. The organic stains from blood or foods can be eliminated using chalk powder. You can crush white chalk, allow it to stain overnight and then dust it off using a clean cloth. You must store your leather handbags in the dust bag. You can also wrap the metallic parts or Chrome using acid-free and clean tissue paper. If you just finished cleaning the bag, let it dry completely before storing it. In case you will store your bags for long-term, easy-open straps and buckles so that the impressions are properly released. This also helps in avoiding permanent creases and rubbing on unwanted areas. Aside from above-mentioned ways on how to care for leather handbags, individuals are also advised not to clean using alcohol, mineral spirits and more as these will just result to dryness of material and discoloration. Don’t let your leather handbags be soaked into the water for so long or in case it gets ultimately wet, absorb much water as possible using micro-fiber hand towels and let the bags dry completely before storing them. Tags: leather handbags, vintage leather handbag, handmade leather handbag, women’s leather handbags, leather handbags online, genuine leather handbags, black leather handbags, luxury leather handbag, ladies handbags online, soft leather handbags, vintage handbags, red leather handbags.